Duck and Duck are so neat, organized, polite, mannerly… Moose, not so much! Duck and Duck spend all morning cleaning the house, Moose crashes through the wall wrecking the table they have just set. Duck and Duck work at creating pieces of art, Moose falls splattering paint and destroying the statue. Duck and Duck hang balloons and bake a cake, Moose is ordered to leave the house. Duck and Duck hang the banners, wrap the gifts, make the punch… but where is Moose? Sudipta Bardhan-Quallen writes a two-word simply perfect picture book. 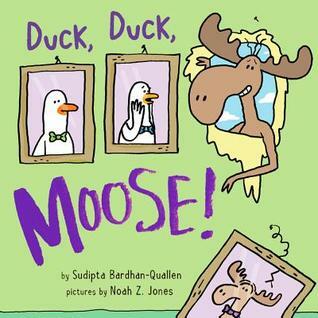 Children will love the rhythm of the familiar playground game transposed in this funny and touching story of a clumsy misguided Moose and the Ducks who love him! Noah Z. Jones adds the details of this almost-wordless picture book. Even without knowing how to read, preschoolers can follow along and retell the story to themselves without missing a thing! I so admire writers and illustrators who work together to tell a whole story! I couldn’t help but feel sorry for poor Moose. His tears broke my heart… and the Ducks’ love for him melted it. This is definitely one for my bookshelf! Yesterday I got the chance to spend the day with my #1 toddler. We went to Story Hour at our public library and got the chance to hear the children’s librarian read Number One Sam. The little ones loved it, the toddlers as much as the preschoolers, so did the adults! Greg Pizzoli has done it again with a clear and simple story that everyone can enjoy. How could you not love this story? It teaches so many valuable lessons about friendship, winning, and doing the right thing. Greg Pizzoli is a genius at choosing just the right words to tell a story. He doesn’t talk down to kids or adults and uses vocabulary that is rich in meaning. And the illustrations are simple and vintage in the way that makes me think of cartoons I watched in the 60’s and 70’s. Sam reminds me of a cross between Underdog and Speed Racer, but then again that may just be me! 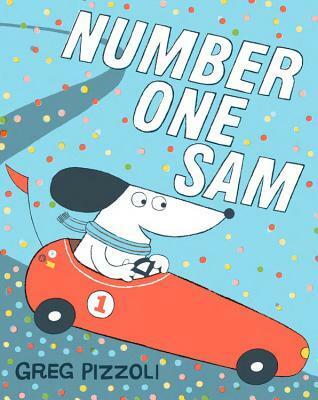 So with the Indy 500 just around the corner… I’ll be rooting for Sam! PS. 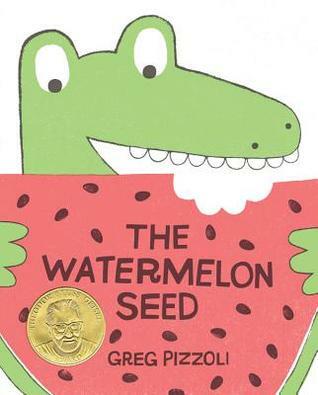 If you remember Greg Pizzoli’s Watermelon Seed, you’ll recognize the alligator in the race.